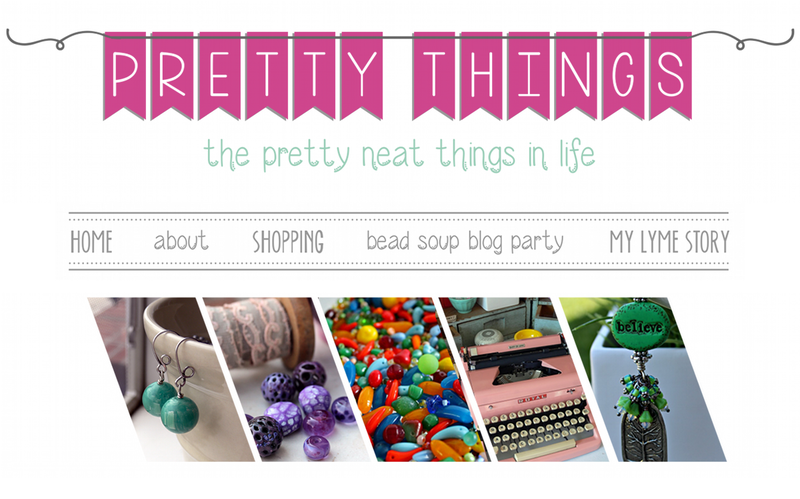 Pretty Things: Bead Soup Party and Bead Swap! This sounds like fun ...count me in! I'll e-mail you shortly. Thanks for your visit and your kind words. I love when you stop by the blog! This sounds like fun! I'm just confused about the clasp. Can you clarify that, please? Thanks, it does! I'm in! Awesome inspiration Lori! I was thinking of doing something similar, but as long as you have already started the party, count me in! Count me in Lori, sounds like so much fun! This sounds like tons o' fun, so I'm in! Emailing you right now! can you give me an idea about how many spacers or beads will be about the right amount? As to the number of beads or spacers -- that's up to you. 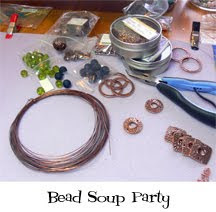 The package of beads you send should be something that, if sent to YOU, would inspire your creative juices. Some focals are so ornate that they don't need many extra beads to go with them. Some plain gemstone focals perhaps could use some extras. oh I wish I had your talent. Alas, I have tried beading and do not have that enate ablility. I'd love to be in on this. I'm international, in South Korea. Is this a problem? Happy New Year, wishing you much happiness in 2010. Hi Lori. Thanks for commenting on my blog! This looks like fun. Do all the beads need to be handmade? No, Jess, they don't. I have some neat gemstone pendants that are a real find -- pretty markings and a neat cut! The key is to put together an inspiring little group to send out. this sounds like it will be lots of fun, please include me! Oh, sounds like so much fun. Just sent you my email. I just sent you an email, I would love to participate! And I also added a button to my blog. sure thing count me in! this is going to be fun!! Hi, I left you an email yesterday. I would love to join, from Germany though - is this a problem? What a fab idea Lori! If I wasn't heading off for the Bead Cruise I would join in the fun. I can't wait to see the results. Happy Creating. Just eMailed you, Lori. I'd love to join the party!! Thanks for hosting this bash! I just came back to see the wondeful women who are participating. I feel so blessed to be part of such a great group. This will be such fun! P.S. Now I need to bookmark all these great sites to visit! 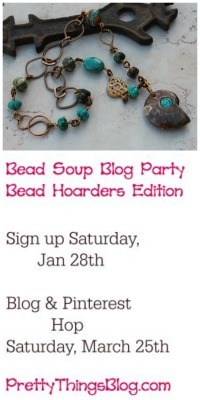 I got your invitation through Art Bead Scene's blog. I'd love to play. Count me in! 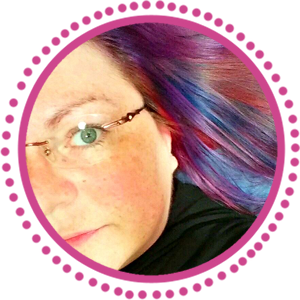 I'll send you and email in a sec, and link your party button to your blog from mine. Can't wait! I just e-mailed you letting you know I would love to join the party! Thank you for all your hard work coordinating this! What a cool idea! Wish I could make real jewelry, I'd love to participate! Just sent you an email, looking forward to the fun. 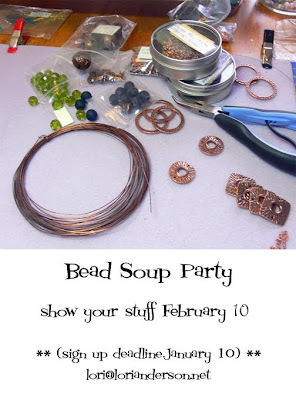 Is this bead soup party still open? 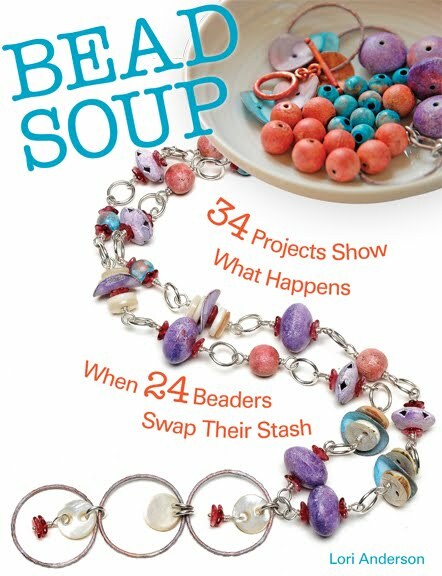 I have never done this and always wanted to so I shot you an email and already have the bead soup photo invite on my blog...weeeeee! So I'll be watching from the sidelines waiting to see all the fab creations. Is it open to people overseas? I'm in the UK. Jo, yes it is -- but hurry, tomorrow is the last day to sign up! That's fantastic, thanks Lori! I'll email you now! Oh and thank you for stopping by my blog and your nice words! This sounds like sooooo much fun, I am sorry I missed the cut off! However, I will have fun checking everyones blog in Feb.!! It was fun to dig around in my bead boxes to find just the right color mix to send to my partner in this contest! Oh, I wish I had done this. Too late, right? Great idea.